A sublime journey, from London to Venice on the world’s most famous train - the Venice Simplon-Orient-Express - is an experience on many travel wishlists. This wonderful holiday combines this luxury, with two nights in the romantic city of Venice and four nights in Florence, the capital of Tuscany. In Venice you can explore at your own pace, whilst your stay in Florence will include a number of excursions visiting the highlights of this picturesque region - including Pisa, Lucca, San Gimignano and Siena. VIP Outbound Titan’s VIP door-to-door travel service collects you from home, for a journey to London Victoria station to board the Belmond British Pullman carriages of the Venice Simplon-Orient-Express (5T), with brunch served as you start this iconic journey. You will be attentively looked after with exquisite service from your personal Venice Simplon-Orient-Express hostess, who will also accompany you during the coach and Eurotunnel shuttle to Calais, offering champagne and snacks. We continue our journey by joining the continental carriages of the Venice Simplon-Orient-Express for the journey to Venice. This evening a four-course dinner is served on board. Please note: dress code applies. Brenner Pass Awake to the beautiful scenery of the Swiss Alps this morning. A leisurely breakfast will be served in your cabin. 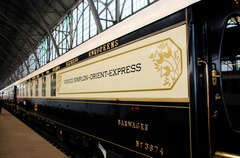 A three-course lunch will be served in one of the luxury restaurant cars and afternoon tea is served in your cabin. Your journey of decadence ends in crossing the Venetian lagoon. After afternoon tea, the train pulls in to Santa Lucia station. We cross the canals by a private water taxi that moors a few steps away from the Hotel Monaco & Grand Canal (4T), where dedicated porters will have transported your luggage from the train station to hotel. Grand Canal A free day to relax and explore. You may wish to visit the stunning and intricately-detailed Doge’s Palace or the magnificent 11th century St Mark’s Basilica. Rialto Bridge is a wonderful place to watch and photograph the constant activity of boats on the Grand Canal below, and the narrow passages that link one piazza to another. Florence Today we walk the short distance to our water taxi and on to our coach to travel south towards the great city of art - Florence, the capital of Tuscany. We make a stop in Ferrara, the City of Renaissance, for a guided tour. After lunch we continue to Florence, arriving at the centrally-located Starhotels Michelangelo (4T) where dinner is included this evening. Vineyard This morning, we walk into the centre of Florence for a guided walking tour. We continue to Chianti Country and the Castello del Trebbio winery for a tour of the family-owned castle and wine cellars. We have an included dinner at their award-winning restaurant. Pisa On arrival in Pisa, we view the famous Leaning Tower. Later this afternoon we travel to Lucca, an interesting and delightful city which hides within its ramparts a rich array of churches, palaces and squares that retain their original charm. Dinner is taken in a local restaurant tonight. San Gimignano We have a full day to explore San Gimignano and Siena. San Gimignano stands on a hilltop surrounded by vineyards and olive groves. We continue to Siena, with its medieval streets lined with picturesque old houses and palaces. You are free for dinner this evening. VIP Inbound This morning we depart for Pisa Airport for a direct, scheduled British Airways flight to London Heathrow or Gatwick Airport. On arrival you will be met and guided to your Titan vehicle, for the journey home.